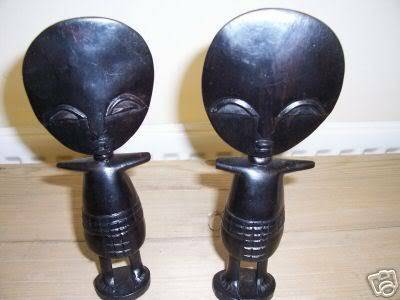 Below is the image of an ebay item for sale recently, titled "PAIR OF AFRICAN WOODEN CARVED STATUES -'FUNNY LOOKINGZ'"
THIS AUCTION IS FOR A PAIR OF AFRICAN STATUES. SIZE IS : 8 1/2" TALL. APART FROM A TINY PIECE BROKE OFF ONE OF THE ARMS, BOTH ARE IN VERY GOOD CONDITION. I ALSO HAVE SEVERAL AFRICAN WOODEN ITEMS IN AUCTION AT THE MOMENT. ...I bet they are transmitting back to their mothership as we speak! Seriously though, look at them! Are these authentic, or are they just (mass-produced) souvenirs? I think they are kinda cute...my daughter would play with them as dolls..
Dunno, sound hand-made. They were for sale on ebay.